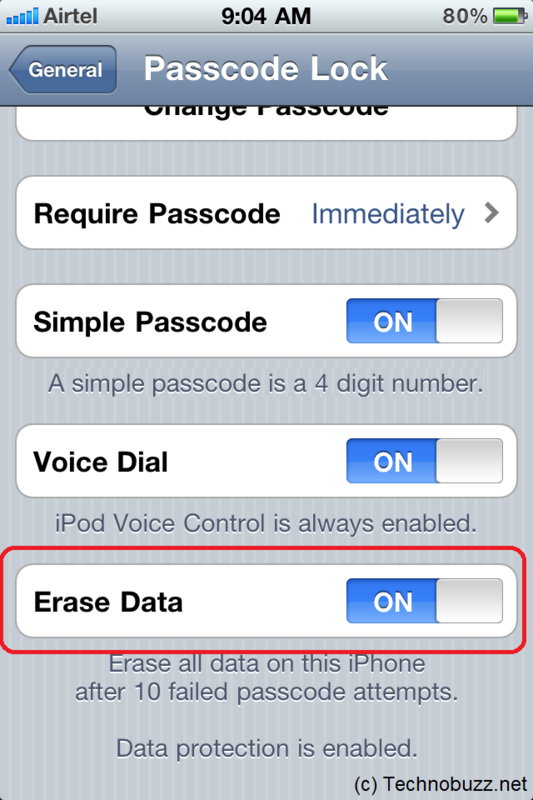 Auto Erase is the one of the useful feature in iOS devices, which helps you to Auto Erase your iPhone data after 10 failed passcode attempts. So it will help you to protect your data if you lost your iPhone. This is a nice feature, because if the device is stolen or with the desktop software if someone is trying to guess your password on the desktop, they won’t get anything after a preset number of incorrect password tries. 1. Open Setting and go to General > Passcode Lock. Now enter the passcode if you have already setup it. 2. If you don,t have the passcode set up, then Turn Passcode on. Here is the Guide how to setup passcode. 3. Now go to the bottom of passcode lock screen and slide Erase Data to ON position. Thats it now Auto Erase feature is Enabled in your iPhone. But be sure to sync often with iTunes so you can recover your erased data.